If you have a five-gallon bucket, a kitchen colander, and a cloth grocery bag, you’re set to grow your own vegetables. If you want to grow your own vegetables, but don't have the space or the time for watering, consider making an Alaska Grow Bucket. Tomatoes, cucumbers, and other plants are well-suited for this system. Jim Lister grew up in Iowa and has been an avid gardener all of his life. When he moved to Wasilla, Alaska, he found the soils weren't nearly as rich as Midwestern black dirt. He perused the Internet for ideas and found a website about growing vegetables in five-gallon buckets. He studied the process and started refining it. "I looked at the idea of using different mediums to grow the plants in and the idea of a wicking medium where the moisture is introduced at the bottom of the container, and then the medium itself is like a sponge and soaks the moisture up," says Lister. "It stays relatively damp all the time." Peat moss, coconut coir, and even old cotton rags make a fine wicking mechanism. To get the bucket ready, drill holes around the outside to allow air in for the roots. Then, all you need are a few other supplies. "Reusable shopping bags and a simple plastic kitchen colander," says Lister. "Just something that will hold the inner reusable shopping bag off the bottom of the bucket so that the water can fill from the bottom, and allows you to connect the buckets together using simple plastic tubing of some sort." Several grow buckets can be connected to a bulk reservoir for automatic irrigation. Lister uses a 35-gallon plastic garbage can to hold the water, but you could use a rain barrel or other container as well. The plastic tubing runs from the water reservoir, to a smaller 3-gallon bucket, where a float valve regulator is used to maintain the water level. As the water is drawn up by the plants, the float will drop and open the valve, automatically replenishing the system. 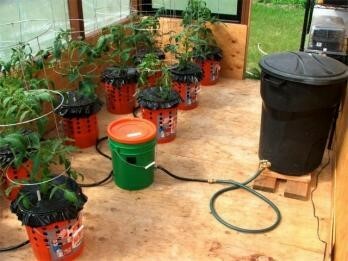 Here are the step-by-step directions for making an Alaska Grow Bucket - from alaskagrowbucket.com.